Diversity often is defined as increasing representation of people from all backgrounds in a particular field, but it’s also more than varying the makeup of an organization, it’s supporting diversity of thought, says Keith Melancon, MD, PhD, director of the George Washington University (GW) Transplant Institute, chief of the Division of Transplant Surgery, and professor of surgery at the GW School of Medicine and Health Sciences (SMHS). 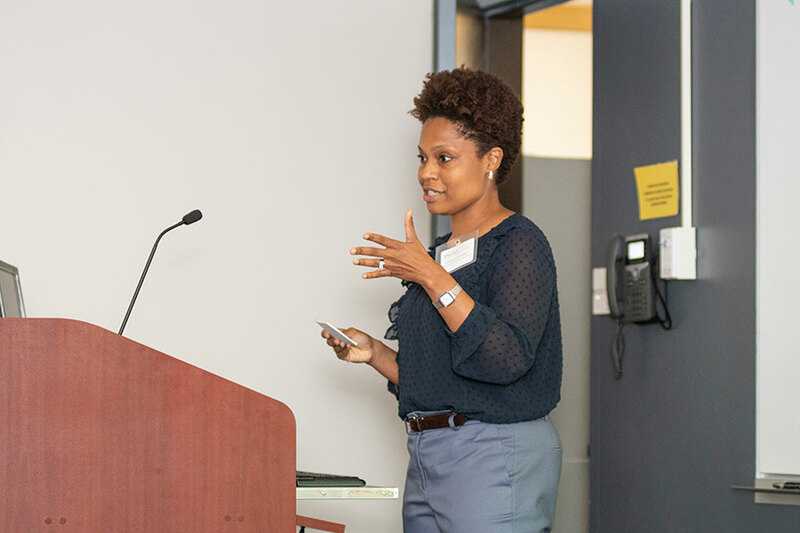 “Without diversity we are all poorer; we would not be where we are without it,” Melancon told a group of students, residents, and fellows at the Building the Next Generation of Academic Physicians (BNGAP) Academic Medical Regional Conference, held for the first time at GW in mid-September. Geared toward students and medical professionals traditionally underrepresented in academic medicine, the conference aims to encourage attendees to consider academic medicine as a career option and offers them resources to further explore that career, said Chavon Onumah, MD, MPH, assistant professor of medicine at SMHS. This month’s event, supported by the SMHS Office of Diversity and Inclusion and the SMHS Department of Medicine, was held in collaboration with institutions including Georgetown University, Howard University, Children’s National Health System, and the University of Maryland. Onumah knew GW had to play a part in the conference when she heard about it from a resident who had attended it a year ago in New York City and raved about what she had learned, said Onumah. From Sept. 21–22, more than 50 students, fellows, and residents participated in sessions offering information on career opportunities in academic medicine, educational and research scholarship, finding an academic residency, as well as a lunch hour panel discussion and a speed-mentoring session. At the start of the first day of the conference, Akman and Melancon told stories about their unique experiences as diverse members of the medical profession. Melancon told stories about being a young black man from southern Louisiana who had dreams of becoming a surgeon, while Akman spoke about his medical school and residency years as a young gay man sitting at the bedside of AIDS patients, listening to their stories.